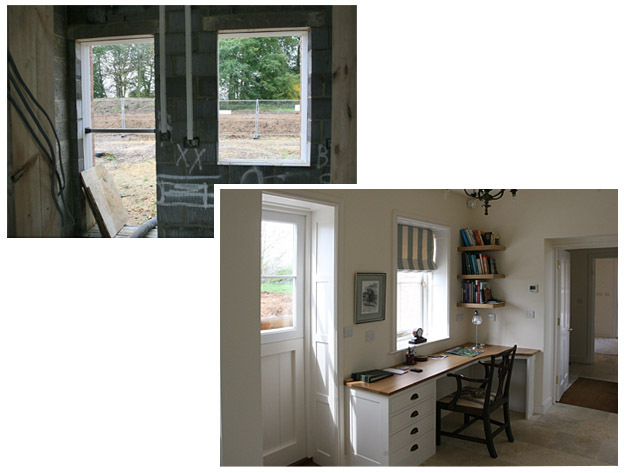 When you’re planning home renovations or starting from scratch with a new build, it’s easy to get mired in the detail of the build – through tireless meetings with architects, builders and contractors. With money seemingly leaving your pocket like water through a sieve, the tendency is to leave soft furnishings right until the end. But this can be a big mistake. Your soft furnishings will be the crowning glory of your project – the final flourish that will show off your style and taste, and will otherwise complete everything that you have worked so tirelessly to achieve. Crucially, your soft furnishings will be the first thing your friends will notice when you proudly show them round (years of client feedback attests to this!). If you have no budget left for soft furnishings at this stage, you will have to hang cheap, possibly ill-fitting curtains and blinds (or ready mades if you’re lucky enough to find any the right size for your new windows), and this will inevitably compromise the wow-factor you were so hoping to create – such a shame after all those months of toil. But fear not! 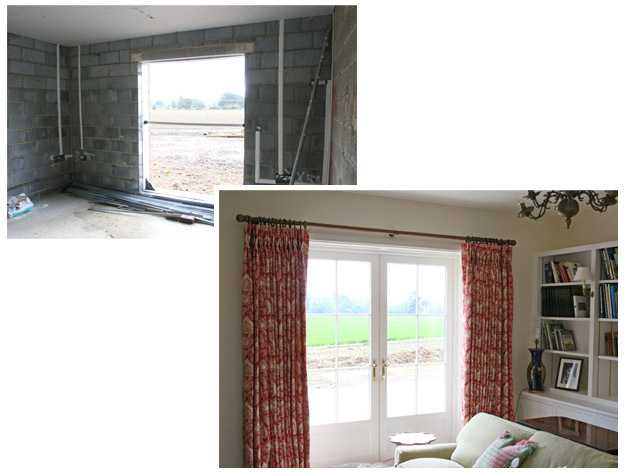 If you’re reading this fairly early on in the build, we hope a recent client case study from beautiful Wiltshire will provide you with hope and a little inspiration – by showing you how earmarking a budget early on enables you to deliver an entire house of curtains and blinds on budget and on time. Transparency helps you save money – whilst this might not be everyone’s preference, we encourage our clients to be as honest and open about their budget as possible. Why? because we’re very transparent about how our prices are put together. If we know what your budget is, we can tailor the product accordingly. For example, fabric makes up the bulk of the cost on a soft furnishings project, and in this case careful choice of a range of inexpensive linen union fabrics from Clarke & Clarke enabled our client to achieve a beautiful bespoke look without breaking the bank. Don’t be afraid to recycle – you may have existing curtains that you spent a great deal of money on and/or are fabricated in a beautiful fabric that you don’t want to get rid of just yet. Curtains have a very low resale value, so in these circumstances it can help your budget to recycle. 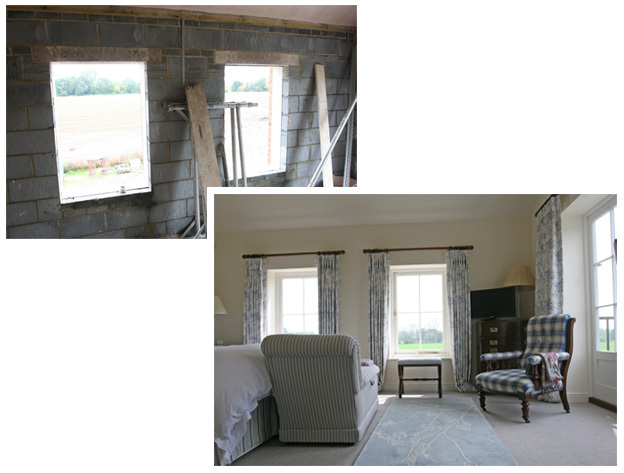 Pictured above – client’s old sitting room curtains in a stunning Jane Churchill fabric were dry cleaned and re-lined. We then added a new 6 inch double pinch pleat heading to add a sense of proportion, bridging the gap between traditional and contemporary – to create a stunning pair of curtains for her new sitting room, that look and feel brand new. Practicality meets aesthetic perfection – in the master bedroom blackout lined and interlined curtains in a stunning but reasonably priced linen union floral print fabric co-ordinate with a striped bed valance for a beautiful look that doesn’t break the budget. 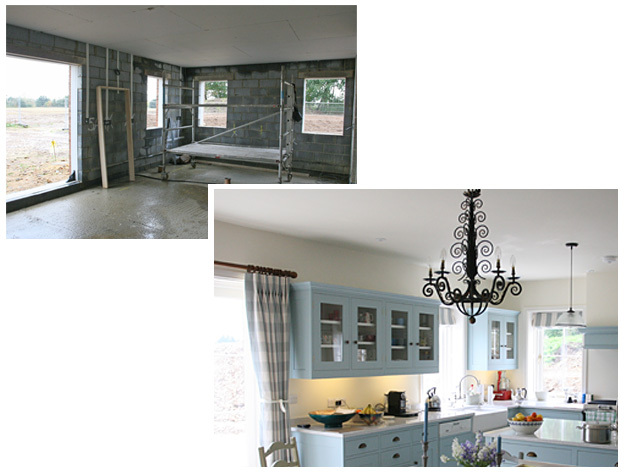 Thinking early about soft furnishings can also help you make provisions for future changes – with the brickwork exposed and electrics being installed, it’s relatively inexpensive to install fuse spurs for motorised blinds (an important consideration with the new blind cord safety regulations). These may not be in your budget right now but with the electrics in place you’ve kept your options open for future upgrades. Installing electrics at a later stage is an expensive and messy process!